The Ocean Bank Convocation Center was packed with elementary and middle school students for Education Day on Jan. 18. 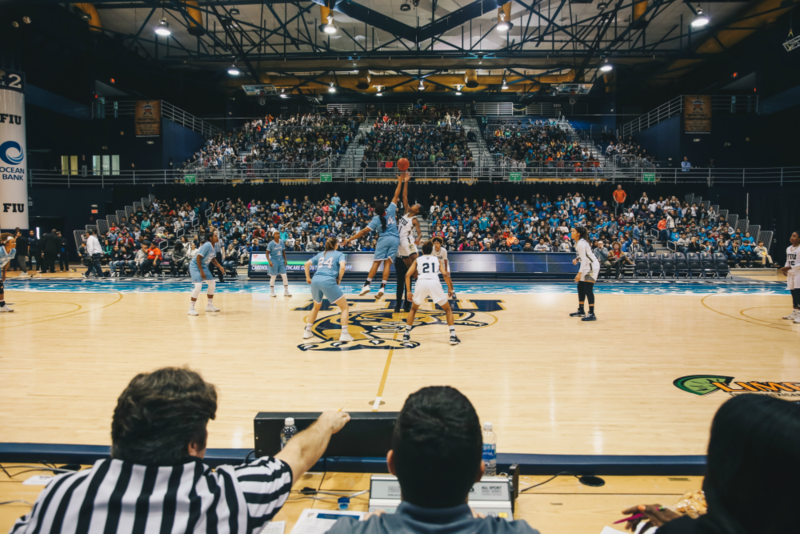 What happens when you pack 2,000 elementary and middle school students into the Ocean Bank Convocation Center for an FIU women’s basketball game? You get noise. A lot of noise. The students cheered on the Panthers to a 57-54 victory against Louisiana Tech on Jan. 18. The event was part of Education Day, which gives youngsters from local schools throughout Miami-Dade County a chance to visit a college campus for the first time. Their day began with a pregame STEM Expo, which featured a wide array of engaging display booths set up by students from the FIU College of Engineering and Computing. During the expo, the young students got to learn more about aerospace, computer science and motorsports. At noon, the students packed the inside of the arena and filled the air with chants of “FIU” and “Let’s Go Panthers” as they counted down for the opening tipoff. With every FIU point scored, the arena exploded in screams and applause. At halftime, they were awed by the leaps and tricks performed by the talented canines in the K9’s In-Flight Frisbee Dog Entertainment Show. It was an experience these students won’t soon forget and will hopefully inspire them to one day attend college at FIU or elsewhere. Back on the court, the Panthers overcame a double-digit deficit in the third quarter and surged ahead to take a slim lead heading into the final 10 minutes of play. With the game tied at 54-54 with 10.7 seconds remaining, FIU guard Kristian Hudson made two free throws to put the Panthers ahead for good. The win gives the Panthers their third victory in their last four games and improves their record to 6-12 overall and 3-2 in Conference USA. It was FIU’s first-ever win against the Lady Techsters (they lost all 11 previous matchups against Louisiana Tech). The Panthers return to action against UAB on Jan. 25 at Ocean Bank Convention Center. Tipoff is set for 7 p.m.